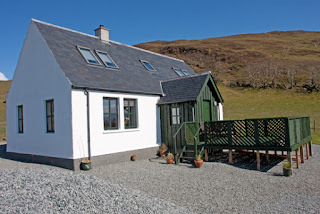 Cnoc an Theine offers self catering accommodation in the village of Aird on the Isle of Sky. The cottage boasts spectacular views over the Sound of Sleat, Morar, Ardnamurchan and the Hebridean islands of Rhum, Eigg and Muck. It is perfect for an idyllic holiday. This stunning cottage takes full advantage of the uninterrupted views from every angle of the cottage. The living area comes with two comfortable sofas, a dining table, wood burning stove and Freeview TV. There are two double bedrooms and one twin bedroom, all equipped to the highest of standards. On the ground floor there is a floor tiled bathroom with bath and walk in shower & on the first floor there is a shower room with WC. 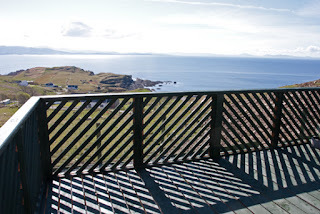 Outside of the cottage there is a sun deck. This is an ideal place to savour the breathtaking views. The cottage is the perfect base to enjoy the romantic Isle of Skye and to explore further afield. You can visit iconic landmarks such as Eilean Donan Castle, Plockton (jewel of the Highlands) and the Applecross Peninsula. Nearby to the cottage is the often deserted sandy beach at Camas Daraich. At the Point of Sleat you can enjoy splendid walks across the rolling hills of South Skye. Be sure to keep an eye out for our local wildlife, from eagles and buzzards to dolphins and whales.